Today was a return back to a normal rep number for me - 2 sets of 8 reps. So that means HEAVY. No skimping or it's just not worth it when you're only doing 2 sets. I actually thought that I was wrong and that it should have been 3 sets, but nope, that's what the rotation called for. It was supposed to be paired with plyo work, but I thought Jason and I might be running after work. So I only did 3 plyo exercises using a 12" step. In the end, we didn't run today. Jason sort of changed up his weight days, so tonight he was lifting. I was a little disappointed as it was a really pretty day. It's getting harder and harder for me to want to do cardio indoors. I really didn't feel up to plyo to be honest, laziness taking hold, but I did opt for a an intense step workout that is made up of a short step combo followed by an intensity blast (similar to plyo). The one I went for was Cathe's Imax 3, which I actually had not done in ages. I only did about 35 minutes then followed it up with abs and a stretch. 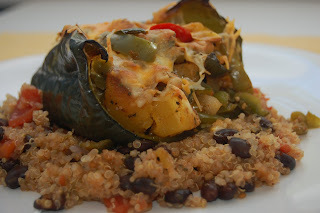 Clearly it's Mexican Monday, so I went with Acorn Squash and Peppers Stuffed Poblano Peppers with Black Bean and Tomato Quinoa. 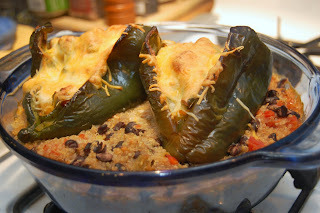 I had 2 monster poblano peppers begging to be used up. How could I resist? Prepare quinoa according to package but adding in the minced onions at beginning of cooking process. Once cooked, stir in tomatoes, green chile peppers, black beans, and spices. Preheat oven to 425. Place poblanos in casserole dish, cover, and pre-bake approximately 15 minutes until just barely soft. In large, non-stick skillet, saute jalapeno, the tops of the poblanos, bell peppers, onion and garlic. Season with all spices except red pepper. When peppers are soft, stir in the acorn squash and cook until just heated. Remove the peppers from dish, pour the quinoa mixture into casserole dish. 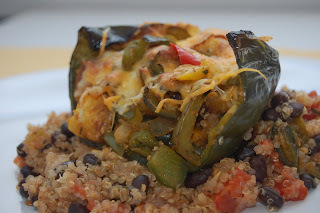 Place the peppers on top of the quinoa and stuff with pepper mixture. Top with grated cheese (optional). Return to oven and bake another 15 minutes, until cheese is melted. The slight sweetness from the acorn squash paired so well with the spicy peppers (thought they weren't overly hot). It was a nice contrast. This quinoa would be great as a side or even in a wrap. Sounds like a good day. Sorry you didn't get to run though. Dinner looks fabulous, as usual! god those peppers look divine! o and such a good idea like u said for leftovers.. in a wrap.. or i guess even just as is chilled overnight. thanks for ur comment too btw.. yup getting lots of rest in today...ahhhh.. hehe. i totally get how frustrating and hard doing cardio is indoors. i find i can never motivate myself indoors. i think u do a good job at it tho even if u dont get to push urself like u want to. Alicia @ Vegan Epicurean I think you can stuff poblanos with just about anything and they're good (well, maybe not meat). Hopefully tomorrow we'll get in that run. Kelsey @ Snacking Squirrel I'm looking forward to the leftover quinoa! It'll make one meal super easy this week and you gotta love that. Glad you're enjoying resting up! I just bought red quinoa at Trader Joe's so I can finally make some delicious recipes! I think I may do this one for Cinco de Mayo. Hey Love!! oooo I hate plyo...but I heard it is so good for you. What 3 moves do you do?? I would love to hear more about your plyo moves! Sorry you didn't get to run...it's always sad to count on it and then have it fall through. That pepper meal looks awesome! i hate indoor cardio..i pretty much run/walk outside in 115F temps or in -25F. I dont discriminate and dress accordingly b/c i feel the power of FRESH AIR trumps all! Megan @ The Oatmeal Diaries Good call on making it for Cinco de Mayo. I may use my leftovers tomorrow too! Kris @ iheartwellness I love plyo! I'm crazy I suppose. Since one other person asked about the moves I did do, I think I'll make that part of my post. But in short, I did wide jump ups, crossovers with weight and slow straddle jumps. Candice @ ChiaSeedMe See my previous reply to Kris. I think I'll add that to tonight's post. I think that's what stunk about not running, that's what I was prepared for. Averie @ Loves Veggies and Yoga I can handle the heat, it's the cold that gets me. But fresh air does take the cake! Awh, sorry you didn't get your run in. Sounds like you had a great step workout though. Okay seriously...this might be my favorite thing you have ever posted!!!!! those peppers look amazing! yes you are right when you lifting only 2 sets you better go hard or go home! Oh yum! I have been on a huge quinoa kick lately! Love the black bean quinoa mixture. Sounds delicious with the peppers! She Fit Thanks so much for stopping by. I did still have a good workout regardless. Thanks Kelly @ Healthy Living with Kelly !! I love stuffed poblanos. Sooo easy. Thanks for commenting Sarena @ The Non-Dairy Queen Love your quinoa ideas. I look forward to reading more on your blog. That looks amazing! Yea sometimes I'm just not up for cardio and I'm completely content just lifting weights. I love the mixture going on here, especially the squash. Dawn @ Healthy Sand Diego Living Thanks so much. Yep, there are days when I only really want to do weights and other days when I want to put those weights off for cardio. Sarah @ The Ordinary Vegetarian Stuffed poblano peppers are so easy. You can really stuff them with anything. If you go with a winter squash or sweet potato and mash it, it helps bind everything and cheese isn't necessary or missed at all. Can't wait to hear if you try it. MmmMMmmm this looks SO so good! Thanks for sharing!! Thanks so much for stopping by Erin @ The Healthy Apron I look forward to checking out your blog now!